i confess, when peaches are in season i go a bit crazy: peach pie, crisp, cobbler, cookies, cake...you name it. i do eat a number out of hand...and add to salads, but dessert seems to be the main option. (does it help that i try to make the recipes as healthy as possible?) :) today i decided to keep the taste of my favorite peach desserts but stay 100% healthy. I made peach crisp smoothies! 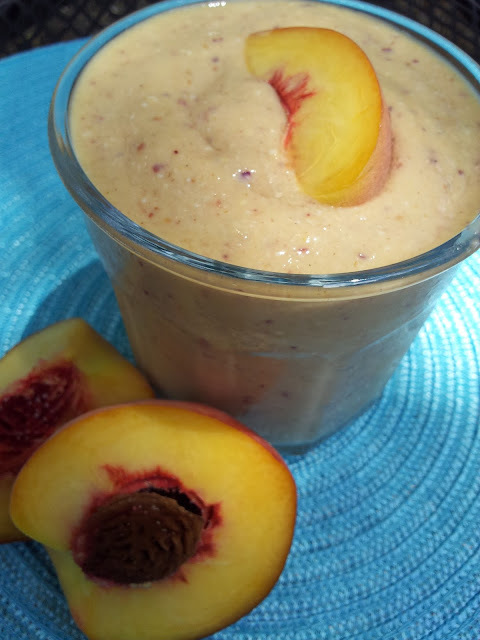 the secret is to add oats used for oatmeal to a smoothie combination of fresh peaches, unsweetened coconut milk and spices. you will be amazed at the transformation...it really tastes like you took a peach crisp, blended the ingredients and drank. happily, aside from a tiny bit of honey, the sweetness comes from the peaches. perfect for a guilt free dessert or a healthy breakfast or lunch. tip: i freeze fresh peaches to make my smoothie very cold. you can skip this step if you wish. enjoy! Combine all ingredients in blender. Blend at high speed (i use the ice crush speed) until combined, thick and slushy. Pour into serving glass and serve. I love the idea of peach crisp in a smoothie - what a fun smoothie! What a great idea for breakfast on the run. Love the idea of coconut milk and peaches mixed together. Sounds delicious! And those pictures are making me crave peaches! lol! Wow love this peach smoothie. Excellent idea to add oatmeal. I used fresh peaches because I didnt have them frozen, so I add 6 frozen strawberries a bit more honey and one whole banana. Fab-u-lous. Cant wait to try the horcata.